In verse 10, the demon speaking on behalf of the others begs Jesus not to send them out of the country. And in verse 12 the other demons are begging to enter the pigs. This reference to a herd of pigs reminds us that this takes place in Gentile territory. Jews don’t raise pigs. They are considered unclean animals in a ceremonial sense. And the unclean spirits want to enter these unclean animals if they must leave. Verses 10 and 12 are the first of three begging requests made of Jesus in this passage. It’s really the same request made in two different ways: “Don’t send us out of the country; but do send us into the pigs.” A negative request then a positive request. We don’t know why these demons wanted to enter a herd of pigs. It clearly shows that Satan and the demons have to get permission from Jesus to do whatever they do. Though fallen and evil, they are still under God’s authority… and they know it. We see this demonstrated in the book of Job as well. Demons are not autonomous. 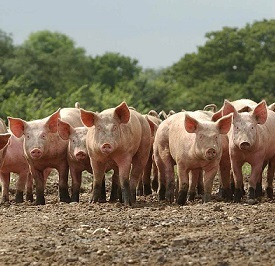 But why a herd of pigs? Scripture doesn’t tell us the answer to this question. A possible reason is that demons want to inflict as much damage and harm as possible, and a herd of frenzied pigs might allow that. So demons can possess animals for evil purposes, even though animals don’t have spirits; they can function in that way. This is such a graphic and dramatic scene! As I said, I have no idea why the demons begged Jesus to enter the pigs. I know they want to be in physical bodies to do damage and to destroy and to kill. But when it comes to why Jesus gave them permission, I think the answer is a bit more obvious in Mark’s telling of this narrative. Why would Jesus allow this? Because as soon as Jesus cast the demons out of the man, it became obvious that the demons had in fact entered the herd of pigs. They became a visible manifestation that Jesus had delivered this Gentile man and that the demons had entered the pigs. According to verse 13, as soon as the demons entered the pigs they rushed down the steep bank into the sea and drowned in the sea. As the question implies, the demons had to go somewhere else after the pigs died by drowning in the sea at the bottom of that cliff in Garasa. But where did they go? The context here is that Jesus is exposing the empty efforts of the phony exorcists in His day in Israel. There have always been false claimants to the power of exorcism, even today. Yet Jesus only gave this power for a limited time to two groups in the New Testament: the apostles and the 70 whom He sent out to minister in His name. No one has this authority today. However, God still delivers people through faith in Christ. It is the gospel which is the power of God to expel Satan and demons when a person hears the gospel, believes it unto salvation, and is delivered. The false exorcists attempt to cast demons out of people, and the demons may leave for a brief time, but they come back later. This is what Jesus was describing in this passage. For the person Jesus is describing in this passage, there was no true deliverance through saving faith in Christ. Instead, they only had external moral reform. So their life was cleaned up, but they were still unregenerate. Therefore, the unsaved person who has a demon cast out of them without being saved through faith in Christ, that individual ends up in a worse state than they had at the first. This describes a place of discomfort, desolation, barrenness, and great frustration. From this and other references in Scripture, it seems clear that demons prefer to inhabit bodily creatures, especially unsaved human beings. The desires of demons is to do harm and damage through human vessels. So after the legion of demons left the pigs in Mark 5, they likewise went through “waterless places seeking rest.” They sought to inhabit another living creature somewhere else.